When I was in high school, softball was always a nice outlet for me. I wanted to play Division I, and I practiced constantly. I enjoyed it, but I wasn’t obsessed with it the way that I am now. I sometimes needed some convincing to go out and practice, and I was honestly a little embarrassed about the time and effort that I put into becoming a better athlete. Most of my friends didn’t play sports and they therefore didn’t understand my athletic commitments or my competitiveness. Let’s be honest: in high school, social acceptance is a huge priority. The problem with that is that we only have enough energy to really focus on a few priorities at a time. With all of the social and emotional changes happening in high school, a lot of energy gets expended in ways that don’t necessarily bring us closer to meeting our life goals. Of course, if I knew what I know now, I would have pursued my goals with much more fervor. Fortunately, though, I learned from my mistakes, and have gotten very good at achieving the goals I set out for myself as an adult. So let’s talk about how you can do the same. What I need you to know is this: your priorities are going to shift DRAMATICALLY throughout your life. The key to actually feeling that you are leading a successful, fulfilling life is to just focus on a few things at a time, understanding that it is perfectly fine to not be perfect at everything. I recently finished my latest book entitled, The Best Self-Help Book Ever Written. Of course, the title is meant to be funny, but I also wanted to fill a gap that I feel exists in the market of books on self-help. I wanted to write a book that was humorous, down-to-earth, and briefly touched on a bunch of different areas of life that you might want help in. I am a little bit of a personal development addict, but I found that, with reading most personal development books, about halfway through I’m like, “okay, I get it. Let’s move along.” Unfortunately, most books tend to go over the same information again and again. Not this book! Hence, why it is The Best Self-Help Book Ever Written. So the book will be available on Amazon in just a few short weeks. If you are eager to be one of the first people to know about its release, make sure that you are on my email list. You can sign up at www.flawlessfastpitch.com. 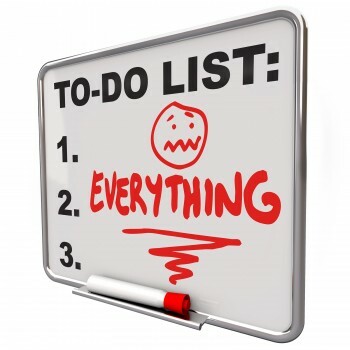 In the meantime, though, let’s help you to figure out how to go after those big priorities. 1. Think about the things that would make you feel most fulfilled. This is slightly different from what will make you HAPPY. Binge watching Game of Thrones might temporarily make you HAPPY, but it WILL NOT help you to lead a more fulfilling life. Being more altruistic or volunteering your time at a soup kitchen WILL make you feel more fulfilled. Getting a scholarship (athletic or academic) will be very fulfilling as well. Only you know what will be most fulfilling to you. Sometimes you have to think about it for a while. That’s fine. It’s better to take some time to decide how you want to spend your energy then it is to spend a bunch of time working in the wrong direction. 2. Make friends with people who have similar priorities to you. In college, social acceptance was no longer an issue because my softball team was like a family away from home. I really didn’t have any major social stresses in college because I felt so close to my team. On the other hand, I felt more stress from an athletic standpoint than I had ever felt before. This was mainly because I was injured, but it was also a result of the fact that I was so close with my teammates that I never wanted to let them down. Having friends who wanted to do well on the field and in the classroom simplified my life dramatically. I rarely ever felt like I was missing out on anything socially, even when I was addressing my other priorities. I also wanted to travel and be of service to others, so I did some volunteering and also went on a service trip that my school offered. My point is that you can often address all of your priorities if you spend time in the right social circles and allocate your time well. 3. Know when some of your priorities need to change and be prepared to shift. For the years leading up to having our foster children, and then our beautiful son, almost EVERY priority I had involved growing my business and traveling. I could seriously teach a course on developing business and sales, but I honestly wouldn’t enjoy it. That’s not what I LOVE about my business. What I love about my business is helping girls to achieve their athletic dreams. I love interacting with them, I love the look of understanding that they get when they have been struggling with something and it finally clicks. So as I became aware that we were going to have a family, my priorities took a huge shift: my marriage needed some attention, I wanted to make sure that I was establishing a financially secure environment for children, and I wanted to be able to speak Spanish (because I would love our children to be bilingual). I still adore my business and it is a huge priority in my life, but I am not longer pursuing hours of courses on marketing. I just decided to focus on the part that I love and cut way back on expenses (taking all of those business courses was expensive). This is how balance and happiness are really achieved. It’s not about stretching yourself so thin that you can’t breathe. If you are an adult, before you get that second job that is really going to take time away from your family, try cutting out some expenses (even daily coffee and dinners out add up), and look at some investment solutions to grow the money that you currently have. Make the life that YOU want, not the life that’s going to look pretty for your neighbors and friends. If they are really your friends, they wouldn’t want you to go into debt buying that new car anyway. Take some time for yourself today and settle on the priorities that are most important to you. A little time in this area will set you up for a better, more fulfilling future. Neat blog, right? Get more every week at www.flawlessfastpitch.com.